2GATA Askeri Tıp Fakültesi Hastanesi, Nefroloji Kliniği, Etlik, Ankara Background: The introduction of hemodialiysis has prolonged the lives of patients with chronic renal insufficiency. To maintain them on long-term dialysis, vascular access procedures are required. We have been using high radial arteriovenous fistula (HRAVF) technique since 2001. The high radial surgical technique, technical difficulties, and complications are evaluated. In addition the effect of concurrent disease on patency is also examined. Methods: We performed 95 HRAVF s between January 2002 and December 2004, in patients with an age range of (21-78) years and 70% were older than 45 years. Mean follow-up time was 32.8 months. All patients were clinically examined by the surgeon to evaluate the venous and arterial system of the upper extremities. The arterial system was examined with modified Allen"s test; the venous system was examined with venous Doppler ultrasonography. The patency was usually assessed either by palpation for thrill, auscultation for a bruit or by using Doppler ultrasonography. Results: Four HRAVF (4.21%) failed because of spontaneous thrombosis. 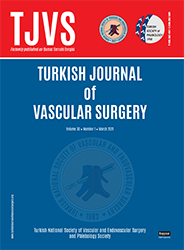 Two HRAVF s (2.10%) required ligation procedures during follow-up period because of venous hypertension. Haematoma was found in two patients (2.10%). No infections or lymph leakage were seen. In 87 patients (91.57%), HRAVF s matured sufficiently for cannulation and no complications were seen during follow-up period.